Alkalinity - a measure of the water's capacity to neutralize acid. Water with a high alkalinity (above 300 mg/L), when boiled for an extended period of time, may form a deposit or develop an unpleasant taste. Water with a very low alkalinity (below 30 mg/L) corrodes pipes and plumbing. Bicarbonate - a buffer ion in water, derived from carbonate rocks and atmospheric CO2. Water with pH 7.8 will be 60- 90% buffered by bicarbonate. If water is heated, bicarbonate can combine with calcium or magnesium to form scale which can clog pipes and precipitate in sinks and laundry. Calcium - an essential human nutrient for bones and teeth. Excessive calcium with magnesium produces hard water, which causes taste problems, scale in pipes, tubs, and sinks and excessive soap consumption. Water softeners remove calcium but replace it with sodium, which may be harmful to people on low sodium diets. Carbonate - along with bicarbonate, this ion accounts for the buffering capacity of waters with a pH greater than 9. It is mostoften present as salts (CaCO3, MgCO3) which precipitate at a high pH. Chloride - less than 250 mg/L is recommended to prevent unpleasant taste. The normal range for drinking water is 5-20 mg/L. High values may be an early indicator of contamination. Chloride also makes water more corrosive towards the distribution system. Conductivity (Specific Conductance) - a measure of the water's ability to conduct an electrical current, it increases as the amount of dissolved minerals increase. Conductivity is used as a check on the total dissolved solids in the water. Hardness - caused mainly by calcium and magnesium, it produces incrustation on pipes, kitchen utensils, and tubs as well as excessive soap consumption. Upon heating, hard water may form scale deposits, alternately, soft water may result in a corrosion of water pipes. In general, 80-100 mg/L is considered acceptable, 200-500 mg/L is considered tolerable, and greater than 500 mg/L is considered unacceptable. Iron - the level of 0.3 mg/L is a general guideline based on aesthetics and taste. It is an essential human nutrient; however, at levels greater than 0.3 mg/L, it stains laundry and plumbing fixtures, and causes undesirable taste in beverages. When exposed to air, iron precipitates causing a reddish-brown color. Iron bacteria is generally more common than sulfur bacteria, simply because iron is abundant in ground water. Iron bacteria are "oxidizing agents." That is, they combine iron or manganese dissolved in ground water with oxygen. A side effect of the process is a foul smelling brown slime which can coat well screens, pipes, and plumbing fixtures. This slime isn't a health hazard, but it can cause unpleasant odors, corrode plumbing equipment, and clog well screens and pipes. If conditions are right, the bacteria can grow at amazing rates. There are several signs that may indicate an iron bacteria problem. Water may have a yellow, red or orange color. Rusty slime deposits may form in toilet tanks. A strange smell resembling fuel oil, cucumbers, or sewage may be noticeable. Sometimes the odor will only be apparent in the morning or after other extended periods of non-use. Manganese is a metal similar to iron which causes a grey/black stain. It can cause staining in concentrations as low as 0.05 ppm. Hydrogen Sulfide is a gas which smells strongly like rotten eggs. It results from the decay of organic matter with organic sulphur and the presence of certain types of bacteria. Even very low concentrations are offensive as well as highly corrosive (silver tarnishes almost immediately upon contact with H2S).Because it is in a gaseous form, H2S cannot be collected in a sample bottle for laboratory analysis. Therefore, its presence must be reported when a sample is submitted for a treatment recommendation. Magnesium - an essential human nutrient for the heart and nervous system. Greater than 50 mg/L may have a laxative effect on first time users. Guidelines are often based on aesthetics (taste). Along with calcium, magnesium contributes to water hardness. Nitrate + nitrite as N- 10 mg/L maximum contaminant level. Acutely toxic in infants under 6 months of age, nitrate produces a blood disorder called methemoglobinemia (blue baby syndrome), which limits the amount of oxygen the bloodstream can carry. pH is an aesthetic parameter. Low pH may cause corrosion of water pipes-while high pH may cause incrustation of pipes. Low pH Water which contains excess acidity tends to act aggressively towards plumbing and fixtures, causing corrosion and staining (i.e.-blue green stains on fixtures from copper pipes). Relative acidity/alkalinity is measured on the pH scale, ranging from 0- 1 4, where 7 is neutral, numbers lower than 7 are progressively more acidic, and numbers higher than seven are increasingly alkaline (basic). The pH value refers not to the quantity of acidity, but rather to the relative acidity/alkalinity of a particular sample. Potassium is an essential human nutrient. It is necessary for nerve impulses. Moderate concentrations are acceptable, but greater than 2000 mg/L may be harmful to nervous and digestive systems. Sodium - an essential human nutrient necessary for nerve impulses. If a water softener is used to remove hardness, calcium is replaced by sodium. People on low sodium diets using water softeners should have the sodium level of their water checked and consult a physician. Less than 20 mg/L is ideal. Sulfate - recommended to be below 250 mg/L for health and aesthetic reasons. The major physiological effects when exceeded are catharsis (laxative effect) and gastrointestinal irritation. Sulfate may produce noticeable taste. Total Dissolved Solids (TDS) Total dissolved solids (TDS) comprise inorganic salts such as potassium, sodium, bicarbonates, chlorides and sulfates and some small amounts of organic matter that are dissolved in water. Total dissolved solids over 500mg/l may result in your water having a bitter or salty taste (brackish water); result in incrustations, films, or precipitates on fixtures; and corrosion of fixtures. This program is designed to help our customers choose the best RainDance Water Systems products for their water chemistry. We encourage all customers to take advantage of our Free Water Testing Program before any purchases. We also offer free water testing after your RainDance Water Systems purchase. We recommend customers send water samples in at least once a year. Our tech's can then inform you of how well your system is performing. 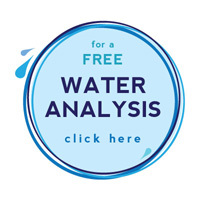 For more information on how to join our well water testing program please click on our FREE WATER ANALYSIS ICON. If you already have a well water test report please e-mail our staff at sales@raindancewatersystems.com or fax your water report to 1-760-896-6999 for a recommendation.